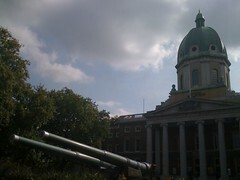 A couple of weeks ago I finally had the opportunity to visit the Imperial War Museum in London. Having been to the Manchester branch (if that is a term you could use for a Museum) I had certain expectations, and although not all of turned out to be correct, I was pleasantly surprised. The entrance of the Museum in Lambeth has a very different feeling to the one that the modern building in Trafford Park confers to the visiting experience, which is enhanced by the machines shown in the Large Exhibits Gallery. 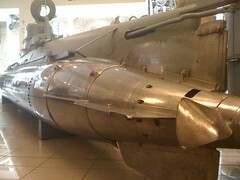 I was very interested in a couple of of the one and two-person submarines they have in there (see picture below). It is indeed a big place. I had enough time to go around the ground floor and the basement, where they have an exhibition that replicates a home around the time of the Second World War. That alone deserves a visit (together with the cafe)! !